FORWARD OPERATING BASE ZEEBRUGGE, Afghanistan – The job was called in like many others: “We’ve got a mortar mission now!” yelled Staff Sgt. Gregory Sanders, the platoon sergeant for the fires team here. With that, a handful of Marines with Golf Battery, 2nd Battalion, 11th Marines, out of Camp Pendleton, Calif., scrambled through the darkness Sunday night to an 81mm mortar tube on this mountainside base in Kajaki district, Afghanistan. A small group overseen by Cpl. Wesley Neville, a squad leader, launched a series of illumination rounds over a rocky ridgeline and lit up the sky. The rounds exploded in white light and washed everything below in eerie light as they slowly fell from the heavens like fireworks. 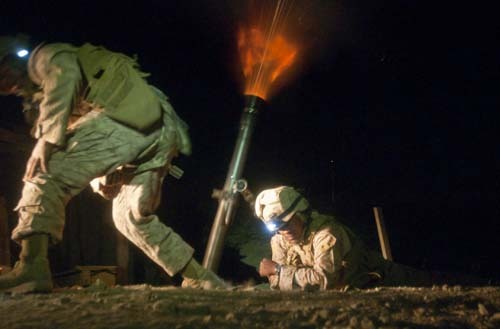 Missions like this, where Marines man both mortar tubes and M777 Howitzer artillery guns, are common. The illumination rounds can serve a variety of purposes, from providing coalition snipers better visibility to forcing likely insurgents to react, Marines said. Taliban fighters frequently meet under the cover of darkness and decide who to track from a distance. Photographer James Lee and I observed the mission in the darkness and watched Lance Cpls. Andrew Baxter and Ahmad Garland scramble with Neville to get their work done. They sent five shots over the horizon then wiped the sweat and dust off their brows. I’m writing this blog entry from FOB Whitehouse, the headquarters in Kajaki for 1st Battalion, 8th Marines, out of Camp Lejeune, N.C. I’d like to thank the Marines of Golf Battery and Alpha Company 1/8 for their candor and hospitality while we were in their neighborhood. Great job of keeping us informed. Your articles are well written and very insightful. I have a son who is currently with the 1st Batallion, 8th Marines out of Camp Lejeune, N.C. Reading about your observations helps keep all of us back in the States close to what’s going on and what it’s like. Keep up the good work, thanks again! Thanks so much for this blog! My son is with the 1/8 and I really appreciate the insight into his experience. Be safe…I’m praying for you all! I’m Ahmad’s brother, and I am so proud of him. Thank you for the excellent reporting. I believe that it helps all of us stay connected. We are so proud of our son, Ahmad and all the other Marines over there. We are continually praying for your safety. Thanks so much for your great service of keeping us informed of the happenings in the battle zone. Ahmad, we are anxiously awaiting your safe return home! We love you.